An Audience With CLGdotTV No3 - What now for social care? Will the Green Paper ever arrive? Joe Tibbetts is the founder and CEO of CLGdotTV. He hosts Working Lunch and chairs AnswerTime the CLGdotTV panel show. Joe chairs conferences and advises public and private sector organisations on how to get heard. This programme is also available as a pocast, see below. Former Care Minister Paul Burstow and Joel Charles of Future Care Capital set out their hopes for the much anticipated social care green paper but the discussion suggests that these may be running ahead of expectations…. The Green Paper will present an opportunity for what has become, through long delay, a desperately needed settlement for social care. The vision needs to be long term and the system sustainable beyond the natural life span of the government that delivers it. Accountability needs to be sharpened at local level and there needs to be better alignment between the different players – in health as well as social care. People need to be made aware that individuals, by and large, have to pay for social care, and the public needs to be prepared for proposals – like the ill-fated dementia tax – that attempt to fund the system properly and also make it fairer for ‘self-funders’. Above all, there needs to be a re-think about data collection and use. The existing data that are collected, mostly for monitoring purposes, are unhelpful when it comes to thinking about doing things differently, and there needs to be much more local, granular data available to reflect the more complex needs of changing and ageing populations. NB Spotify and iTunes do security moderation and may take 24 hours to make our podcasts available. 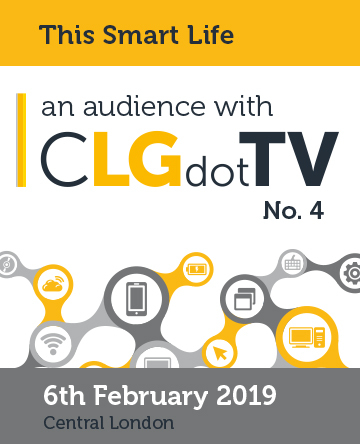 On 6th February 2019 we will be making five programmes about 'smart lives' in front of a studio audience. You could be in front of the camera or in our expert audience. Our smart lives are no longer connected to place. We carry This Smart Life with us everywhere we go and overlapping coverage allows ever more ubiquitous connectivity. We no longer notice or count the spaces where we can connect, we only notice when connection is poor or when we cannot connect at all. This Smart Life is a whole new world. Programmes will be online from 11 February, and will also be available as podcasts. An end to commuting and to traffic congestion; work as state of mind not a place of labour; the future of private car ownership if there is one; my data total recall, voice bidable things; identity and personal security. This programme is being sponsored by Dedrone, with guest panelists Amit Samani of Dedrone and Elaine Whyte of PwC. Further details on content will be published in due course. All this takes place at 58 Victoria Embankment (the NESTA building) two minutes walk from London Blackfriars Station. Cameras are rolling by 10.30am and it's all over bar the handshakes by 4.00pm. Lunch and refreshments? Of course. But let’s be frank, it’s the quality of the brain food not the sandwiches that make this the single most useful ticket for those shaping the future of UK local public services. An Audience with CLGdotTV is now running ten times a year. We invite a studio audience of around 50 to join us to make five CLGdotTV programmes. There are no power-points and the questions and interventions from the floor are valued as much as the panellists' contributions. Some guests stay with us for just one programme and some stay for the lot. It’s a logistical nightmare but somehow we make it work. Each programme is broadcast on CLGdotTV. Plus we edit a 30-40 minute video summary of the day’s conversations with clips from all the debates. connectedlocalgovernment.tv (CLGdotTV Limited) is an independent, privately owned, limited company, registered in England and wholly owned by its directors.